I could have sat on the balcony all day...the view is rather hypnotic! Only drawback is that hill, but without that you would not have the view. Perfect location for our honeymoon. Beautiful views and lovely staff, would highly recommend to all family and friends. You were flexible with our check in time and easy to deal with. The room was clean and tidy. Appreciated the customer service in moving us to a different apartment which contributed to an excellent experience and fantastic views. Had a lovely stay. Apartment was ideal, very spacious and the location is perfect. Excellent well appointed apartment, great location, great views. the receptionist was kind and friendly who confirmed our cruise booking. Also we would like to thank Toscana for washing out clothes due to failure of the washing machine in our room. Overall it was a nice stay with great view. We had a lovely few days, would love to have stayed longer. The pools were great, the view was magnificent and the apartment was spacious and comfortable. Only issue was the heating element only had one burner that got hot. Knives are also very dull. Views were awesome, use of a golf cart for shopping would make the stay perfect. The hill was a killer. Very relaxing last day to a busy trip. Nice to have all the amenities - even not having to go down town to buy a bottle of wine was very nice. We were very happy with our stay at Toscana, the lovely lady at the reception desk was fantastic and our room was very spacious and comfortable. Decor is older and could do with an upgrade but in saying that the resort is still a great stay. We stayed 2 nights and had a great time. The apartment was very well equipped for our needs Its in a great location with a great sea view. Jo was very welcoming and explained everything to us (local shops etc) and booked a half day cruise for us. I have no hesitation in recommending Toscana to anyone. Excellent place to stay. Our overseas visitors were impressed. Plenty of room for everyone and well worth a visit. Nice to have our own lock up garage. Hi Anne, Thank you so much for your lovely feedback, we are so happy you enjoyed your stay with us here in Airlie Beach, Whitsundays. We do hope on your next trip to Australia you come and stay again. Wish we could have stayed longer, but will be back. Excellent and clean all round. great views. Staff helpful(extremely) spacious room. Will be back next time in Airlie with the family. Lovely swimming pools and bbq. Very close to town shops and restaurant. Very helpful with tours. Loved the location and comfortable beds. The resort was ok, but the music in the town is very noisy until 12 o more am. Good location. Nice rooms with great view. A couple of small misunderstandings on arrival but the staff were very helpful and able to sort the issues quickly and with a minimum of fuss. I could not ask for better assistance there. The access for people with 4wd is a little tight but it is good to have lock up facilities for the car. The apartment facilities were good and all worked fine which gives flexibility when staying for extended periods. Closeness to town was excellent and made getting around easier. Pay TV plus a video player with movies available in the room a nice touch. Great stay. Fabulous staff. Views beyond description, just awesome. Beware of hill, stairs and driveway worst part of it. But well worth the effort. Maintenance could be better with apartment we stayed in (fridge cracked, shower screen stuck, screen door stuck, dryer did not work) however when dryer was pointed out it was rectified quickly. The rest of the issues should have be found by housekeeping when cleaning and repaired. Other than the maintenance not up to par, fabulous. The pools are glorious. The amenities are exactly what is needed for a stay. Individual garages not large enough for other than sml/med vehicles but we were offered the use of visitor car park. Very happy overall. The frying pan in Unit 15 definitely needs replacing! Would stay here again if we revisit Airlie Beach and would be happy to recommend TVR to friends and family. Great location. Huge unit. The view was incredible. We had a lovely time. Loved the views and relaxing apartment. We had a great stay and loved everything about our apartment, especially the view! Great location, excellent staff and loved the hills for exercise! 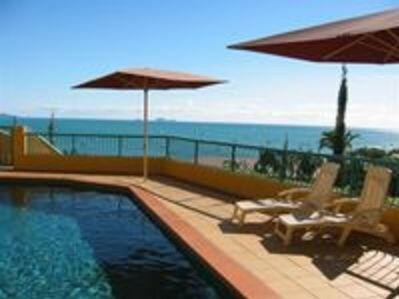 Also great pools, if we return to Airlie Beach you will see us again. Enjoyed the stay, mainly due to the view from the balcony. Very happy. Would definitely book and stay again. We enjoyed our stay at Toscana Village Resort, very spacious , well equipped appt, staff friendly and helpful, location would test your fitness level, would need to be very mobile. Excellent service, lovely apartment. Highly recommended.